His head bowed, a man walks alone in the silvery, cold moonlit night while contemplating a megalithic tomb and its implicit message of death. It is winter, and all around him nature is dying. Leafless trees loom behind like specters, but a grove of verdant oaks rises through the mist in the background with the promise of life. The waxing moon, high in the sky, also acts as a counterbalance to death, symbolizing Christ and the promise of rebirth for the artist Caspar David Friedrich. Friedrich was part of the German Romantic movement; his deeply personal and introspective vision addressed Christian themes through analogies based on the cycles of nature. A Walk at Dusk was among a small group of works Friedrich completed before he suffered a debilitating stroke in 1835. The painting embodies both the melancholy he experienced during this period and the consolation he found in the Christian faith. Crusius Family (Dresden, Germany), probably by inheritance to Helene (Crusius) Voith. Helene (Crusius) Voith, 1842 - 1932, probably by inheritance to her son, Hanns Voith. Dr. Hanns Voith, 1885 - 1971 (Heidenheim, Germany), by inheritance to his heirs, 1971. Prause, Marianne. "Carl Gustav Carus als Maler." Ph.D. diss. (Universität zu Köln, 1963), pp. 38-39. Hinz, Sigrid. "Caspar David Friedrich als Zeichner. Ein Beitrag zur stilistischen Entwicklung der Zeichnungen und ihrer Bedeutung für die Datierung der Gemälde." Ph.D. diss. (Ernst-Moritz-Arndt Universität Greifswald, 1966), p. 93. Prause, Marianne. "'Spaziergang in der Abenddämmerung', ein neues Bild von Caspar David Friedrich." Zeitschrift des Deutschen Vereins für Kunstwissenschaft 21 (1967), pp. 59-66, fig. 1. Sumowski, Werner. Caspar David Friedrich-Studien (Wiesbaden: Franz Steiner, 1970), pp. 131, 155, 167, 218, 276. Börsch-Supan, Helmut, and Karl Wilhelm Jähnig. Caspar David Friedrich: Gemälde, Druckgraphik und bildmäßige Zeichnungen (Munich: Prestel, 1973), pp. 434-35, no. 407, ill.
Börsch-Supan, Helmut. L'opera completa di Friedrich (Milan: Rizzoli, 1976), p. 108, no. 209, ill.
Koch, Horst. Caspar David Friedrich. Stephen Gorman, trans. (Bristol: Artline Editions, 1988), pp. 60, 86, ill.
Bertuleit, Sigrid. "Su rostro no era lo que se dice bello." In Caspar David Friedrich: pinturas y dibujos, exh. cat. Werner Hofmann et al. (Madrid: Museo del Prado, 1992), p. 70, fig. 24. Maclean, Nicholas. "Friedrich's A Walk at Dusk." Christie's Review of the Season (1993), pp. 64-65, ill.
Aschenbeck, Nils, Regine Dehnel, and Wolf-Dietmar Stock, eds. Auf den Spuren von Caspar David Friedrich: Rügen, Greifswald, Stralsund, Neubrandenburg (Fischerhude: Verlag Atelier im Bauernhaus, 1993), p. 69, ill.
Christie's, London. German and Austrian Art, Part II. May 20, 1993, pp. 62-65, lot 352, ill.
Fredericksen, Burton B., et al. Masterpieces of Painting in the J. Paul Getty Museum. 3rd ed. (Malibu: J. Paul Getty Museum, 1995), unpaginated, no. 46, ill., entry by Perrin Stein. Brosche, Peter. "Nachtrag zu Caspar David Friedrich ('Sie betrachten auch die Venus')." Sterne und Weltraum 35 (1996), p. 235. Jaffé, David. Summary Catalogue of European Paintings in the J. Paul Getty Museum (Los Angeles: J. Paul Getty Museum, 1997), p. 45, ill.
Bing, Wai-tze. "A Study of the Dolmen Motif in the Works of Caspar David Friedrich." M.A. thesis (University of Memphis, 1997), pp. 10-11, 14-15, 95-101, 117, fig. A-6. Fredericksen, Burton B., et al. Masterpieces of the J. Paul Getty Museum: Paintings (Los Angeles: J. Paul Getty Museum, 1997), pp. 116-17, no. 64, ill., entry by Perrin Stein. Mohen, Jean-Pierre. Les mégalithes: pierres de mémoire (Paris: Gallimard, 1998), pp. 112-13, ill.
Lyons, Lisa, ed. Departures: 11 Artists at the Getty, exh. cat. (Los Angeles: J. Paul Getty Museum, 2000), pp. 20-21, ill.
Holtorf, Cornelius. 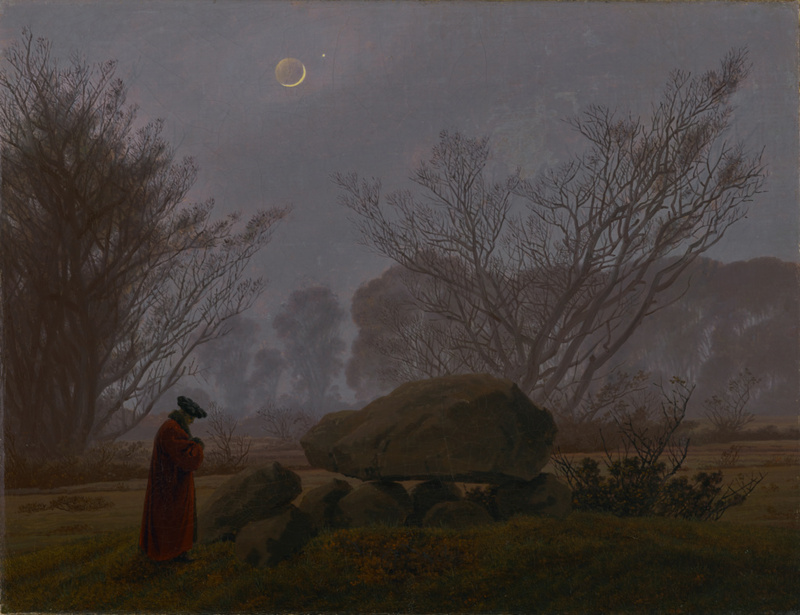 "Imaginary Worlds of German Romanticism: Megaliths in the Paintings of Caspar David Friedrich." 3rd Stone: Archaeology, Folklore and Myth, no. 42 (Spring 2002), p. 37, ill.
Allen, Denise, et al. Masterpieces of Painting in the J. Paul Getty Museum. Rev. ed. (Los Angeles: J. Paul Getty Museum, with Thames & Hudson, 2003), pp. 114-15, no. 63, ill., entry by Perrin Stein. Hipp, Elisabeth. "Paintings from the Galerie Neue Meister at the J. Paul Getty Museum." In From Caspar David Friedrich to Gerhard Richter: German Paintings from Dresden, exh. cat. Jon L. Seydl and Anna Greve, eds. (Los Angeles: J. Paul Getty Museum, 2006), p. 19, fig. 2. Sotheby's, New York. Fine Books and Manuscripts [...]. December 11, 2006, p. 27, under lot 11, ill.
Gunnarsson, Torsten, et al., eds. Caspar David Friedrich: den besjälade naturen, exh. cat. (Stockholm: Nationalmuseum, 2009), p. 149, no. 90, ill., entry by Torsten Gunnarsson. Gunnarsson, Torsten. "Ensam med landskapet och Gud: Caspar David Friedrich liv och verk." In Caspar David Friedrich: den besjälade naturen, exh. cat. Torsten Gunnarsson et al., eds. (Stockholm: Nationalmuseum, 2009), pp. 40, 56-57, ill.